“Developing and Adapting Professional Programs for Energy Efficiency in the Western Balkans” is an EACEA Tempus project, officially launched in January 2014, marking a first for Albania since this is the first TEMPUS project to have an Albanian lead partner, namely POLIS University. The purpose of this project is to contribute to the modernization of education in Albania, Kosovo and Montenegro and meet market needs by developing professional programs in energy efficiency. These programs will be developed and delivered at post- secondary diploma and at professional Master levels in 5 institutes in Albania, Kosovo and Montenegro. The project aims to prepare technicians with well-developed applied skills in this field of Energy Efficiency. These qualified technicians will be ready to work in the chosen profession as well as assist scientific researchers in the field with practical knowledge. The project aims to also establish lasting country-specific partnerships with the educational and business sector for student employment as well as provide policy recommendation for mainstreaming professional programs within each partner’s educational system by 2016. As a wider objective this project aims to address the lack of professional types of educational programs in Albania, Kosovo and Montenegro in the field of Energy Efficiency. Thus, products and activities are geared towards fulfilling this main objective. The project will initiate professional education programs in the field of Energy Efficiency that will vary according to national contexts and educational institution. These programs comes as a response to the demand (from government, industry and potential students) for more applied skills, both in the two-year post-secondary diploma level and in the professional Masters level. The project will bring together expertise and experience for curriculum development and for practical application of energy efficiency. The study programs contain several thematic subjects including foundations, technical knowledge, applied skills, European regulations in the field of energy efficiency, an internship and a final project. The two-year post-secondary diploma programs in particular will serve as a learning experience that will inform the Ministry of Education in the respective countries, and the educational sector at large, enabling them to replicate this type of professional education in many other fields, as also envisioned in education strategies. The professional Masters programs will equip students that already possess ample theoretical knowledge from the field with much needed applied and technical skills enhancing employment opportunities. 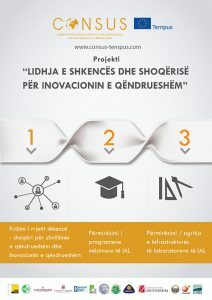 The project has 11 partners in all, Polis University (AL), University Aleksandër Moisiu of Durrës (AL), University of Prishtina (Kosovo), University for Business and Technology (Kosovo), University of Montenegro (MNE), Albanian Constructors Association (AL), Co- PLAN, Institute for Habitat Development (AL), University of Minho (POR), Van Hall Larenstein University of Applied Sciences (NL), Anhalt University of Applied Sciences (GER), Slovak University of Technology in Bratislava (SLK).